Hop into this French Quarter pizza place and you'll find no cajun, jambalaya, or crawfish here. Mona Lisa doesn't put any twist on an already perfect Italian recipe. They do cater to vegetarians though! Mona Lisa serves wine and beer, but also allows you to BYOB (with a corkage fee). This is my absolute favorite restaurant in New Orleans! It's a quaint little family restaurant. Nothing fancy from the outside. But the food is always delicious, the atmosphere is cozy, and the service is friendly. I'd eat here every day if I could! Lesbians in the kitchen, inconsistent food on the table. Some visits are great, some leave something to be desired. Olive Garden type food (though not as good) and expensive. I eat there because it's close and usually fast. Used to always go here until the rude manager finally got to us. We waited outside with a large party (we were not part of). Finally manager seated us and THREW menus on table. We sat there in shock and left a couple of minutes later. Loved the food, but the service needs lots of help. Spare yourself the trouble and go to LA Pizza Kichen. 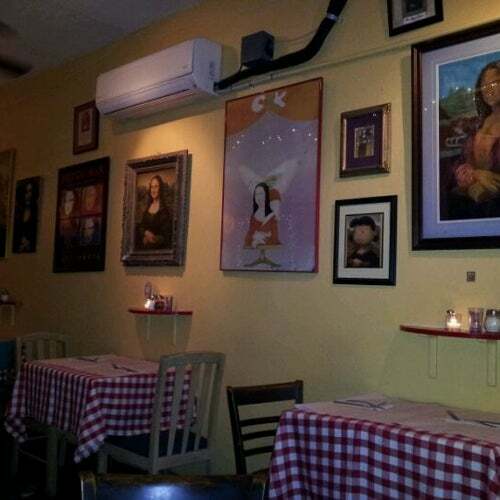 Great home style Italian food in a true down-scale French Quarter ambiance - primarily local clientele. I eat here at least once (usually 2 times) when I visit New Orleans. OK I admit it is not Creole or Cajun but the Italian food here is great. The pastas are wonderful (try the lasagna) and the pizza is yummy. The staff can't be beat. It's a little bit of a walk depending on where you stay but you will get to see a part of the Quarter that is beautiful and seems to be where more locals live than tourists. Love it. And the price is right. Nice cozy place on Royal...Don't blink or you might miss it...You gotta have some of their garlic bread...Food is really, really good!! !